Having lived in Louisiana for many years before moving to Georgia, there are foods I crave desperately now that I’m gone. Crawfish, Boudin, and King Cake top the extensive list right off hand. Oh, I can get frozen crawfish tails at the grocery. Sometimes they are alright, but it’s a real crapshoot as to their origins. Most often imported from China, and more often less-than-delightful, they do a decent job in taking the edge off an etouffee craving. Trying to find boudin in Georgia, on the other hand, is like trying to find a shark in the lake–it ain’t gonna happen. For the uniformed, boudin is a spicy Cajun rice and meat (often pork) dressing stuffed into a sausage casing. Take my word for it, when done well, boudin is to-die-for. 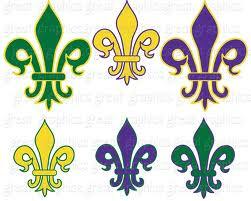 But decent king Cake is accessible (to us) these days, due to growing Mardi Gras popularity across the southern states. 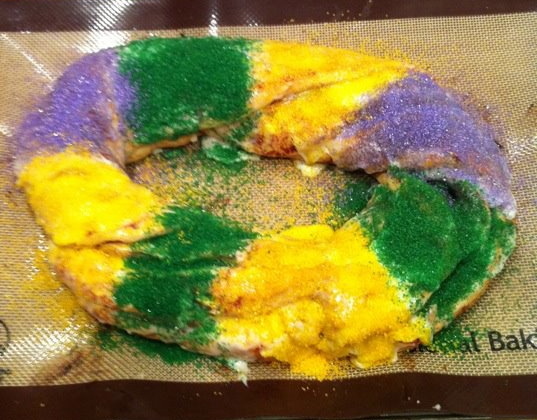 Great king Cake, on the other hand, can be shipped in from randazzokingcake.com, Randazzo’s Bakery in theNew Orleans area–for a hefty price. Traditional king cakes are yeast dough coffee cake with purple, yellow, and green sugars sprinkled in a rainbow and shaped in oval ring. The most delicious ones are filled with cream cheese, cherry, apples and cinnamon, and lots of other wonderful sweetness! I shy away from anything made with yeast–too time consuming for a normal day. But my friend, Stacie, a New Orleans area dentist and resident of Covington, Louisiana, supplied all her Facebook peeps with a wonderful king cake rendition that had me scratching my head at the simplicity and brilliance. See my Food page for the recipe. I miss so many things about Louisiana, mostly my family and friends, but the food ranks pretty high! Previous Don’t Be an Anti-Dentite! We get a fresh Randazzo’s every year, courtesy of my traveling brother in law. I need some investors to help me with my startup bizness, “Shake Your Boudin.”. We serve ice cream shakes and Boudin. This is so easy, even I could make it! I had never had King Cake before this year when I flew into Shreveport and had a quick stopover on my way to TX. In that brief bit of time, my very wise friend took me to a little cafe where I had… wait for it… King Cake Bread Pudding. Let me just say that even as I enjoyed the amazingness that was King Cake Bread Pudding, I was simultaneously saddened by the realization that the only way I can ever have it again is to venture back to Shreveport LA. Sometimes I still think of it, and long for it. Seriously, King Cake is good. It is. But King Cake Bread Pudding is the high point of living. Oh Mary Beth, I can think of little letter than king cake bread pudding. Makes you want to dive in and roll around in the stuff. You should join me in Shreveport at the NOLA RWA conference this weekend. I will sniff out every dish resembling bread pudding while I’m there.